There has been so much bad news lately about this nation’s schools. From terrible tragedies to questionable morality to a complete separation from God, our nation’s schools are hurting. For many of you, this is the reason you have chosen to partner with Brentwood. You want a safe place that is community-based that keeps Christ firmly in all discussions. Many of you make real sacrifices for your children to attend Brentwood. From time in the car to money spent, sometimes you might ask yourself if it is worth it. Look closely at this picture. 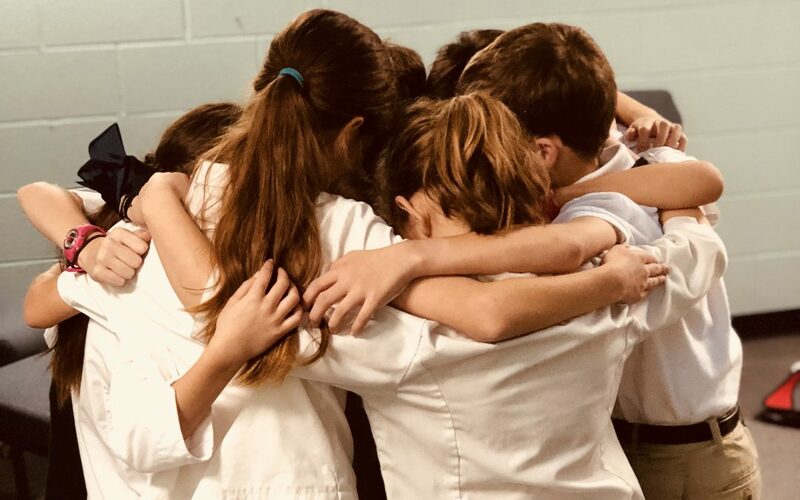 You will not find a clearer example of Christ than in this picture of children, those He called most precious, locked arm in arm surrounding their friend and praying for her confidence and courage. This spontaneous act tells you everything you need to know about educating your child in a Christ centered school. Yes, our little Bear competed and did great. She did not need to be consoled or prodded by a parent or a teacher. Her friends brought her to Christ and she carried on with the confidence of a child in His arms and in His love. And this confidence and love was brought together through the locked arms of children who were wise enough to take their concerns to God. What an absolutely beautiful lesson! Thank God that today I am a Brentwood Bear!